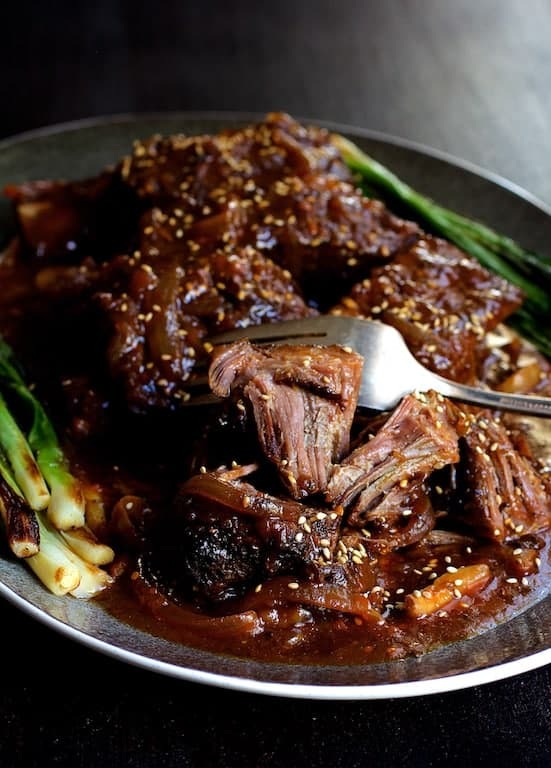 Korean Braised Beef Short Ribs are slightly spicy, slightly sweet and totally amazing! Slow-braising makes them fall-off-the-bone tender! You know the old saying about March winds that bring April showers that bring forth May flowers. We’re running about a month ahead here: February was windy as all get-out and it’s now March and it’s raining like crazy! April should be flower-filled and gorgeous! With spring coming so early, it occurred to me recently that I never had a chance to make one of my all-time favorite winter dishes–braised beef short ribs. Before it got too warm, I had to rectify that! 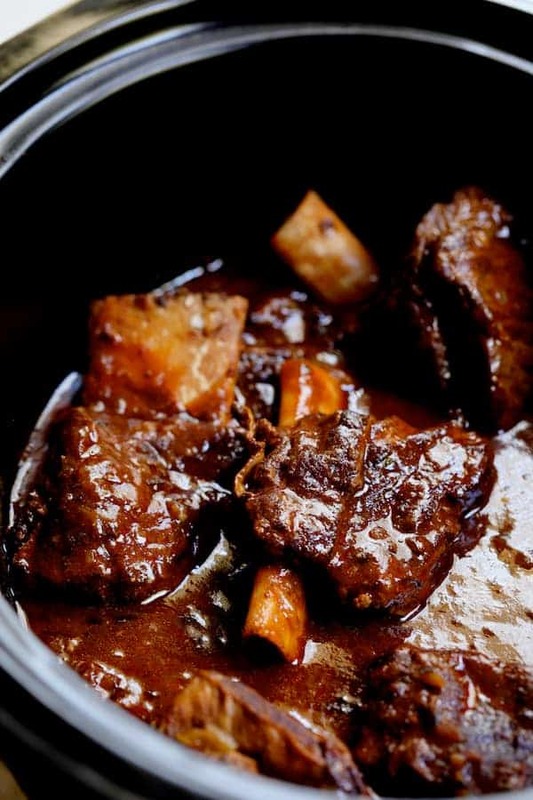 One of my favorite cooking methods in all the world is a slow braise because, with a little time, it is truly magical how a tough cut of meat transforms into something buttery and fall-off-the-bone tender. When this magical cooking method is paired with a robust cuisine such as Korean, the combination is truly extraordinary. Korean cuisine has grown in popularity in recent years and will likely remain so. The cuisine always seemed mysterious and intimidating to me until I was intrigued enough to try one of Korea’s staple side dishes—kimchi. Ask your butcher for long-cut beef short ribs on the bone. 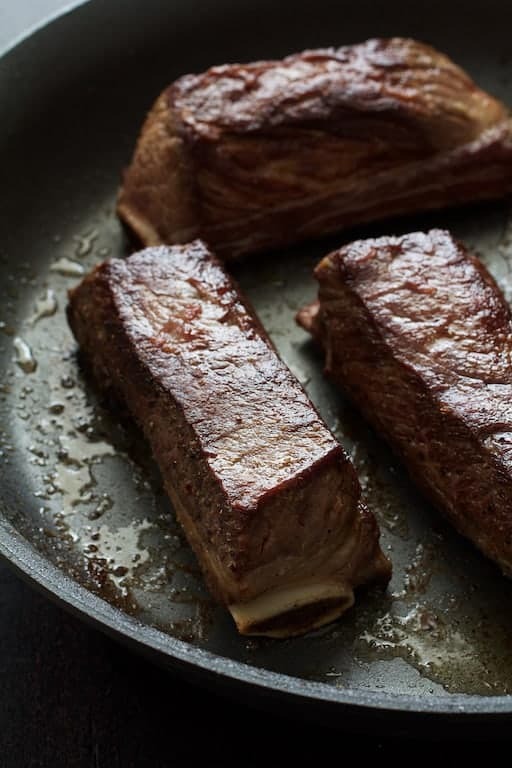 Beef short ribs can appear intimidating at first with their boney, hunky appearance. Don’t let that scare you! This recipe is scaled for two people. I like to use four ribs for two servings because as the connective tissue melts away, they shrink quite a bit. Trim as much fat as you can. Brown well on all sides. Place in the slow cooker with simple ingredients found in any grocery store and let them cook away! It’s not often I use a slow-cooker for just the two of us, but because of their size, four long-cut bone-in beef short ribs fill a large oval slow-cooker nicely. If four ribs end up being too much, they reheat beautifully. Thicken and serve! One of the main characteristics of Korean cuisine is the abundance of side dishes and condiments served at the table. In addition to the seared scallions in this recipe, serve with kimchi, brown rice and fresh, shredded carrots. This recipe uses gochujang, an ingredient that is being referred to as the “new” sriracha. I call it umami in a jar! Loving this stuff! Gochujang is a savory, spicy, slightly sweet, fermented Korean condiment made from red chiles, rice, soybeans and salt. I found it at The Fresh Market, however, it can be found at international markets or online. Be sure to try one of my other braised beef short rib recipes–complete with side dishes! Combine first 9 ingredients in a slow cooker. Set slow cooker to high to preheat. Heat 2 tablespoons oil in a large skillet or sauté pan over medium-high heat. Generously season beef short ribs with salt and black pepper. Add short ribs to pan, reduce heat to medium and brown well on all sides, approximately 2-3 minutes per side. Transfer ribs, meat side down, to slow cooker. Cover and cook on high for 4-6 hours or until very tender. Heat remaining 1 teaspoon oil in a skillet or sauté pan over medium-high. Cook scallions, 2-3 minutes or until slightly softened and browned. Serve short ribs with scallions, kimchi, cooked brown rice and shredded carrots. MAKE AHEAD: These beef short ribs reheat beautifully. Reheat in a 350 degree oven for 30-40 minutes or until heated through. FREEZER-FRIENDLY: Cool thoroughly, package securely in an airtight container and freeze up to 3 months. Thaw in the refrigerator and heat 30-40 minutes or until heated through. The nutritional information below is only an estimate. Please do your own research with the products you're using if you have a serious health issue or are following a specific diet. Using low-sodium products will reduce the sodium level considerably. Made this with some random pork rib bits I had in the freezer without the pepper sauce due to personal taste. It was amazing! Doubled the sugar by accident, but it was not too sweet at all. Definitely will make again. Thanks so much, Betty! By all means, you should adjust to your personal taste! Some people like the spice but others don’t and that’s okay. So glad you enjoyed and please stay in touch! 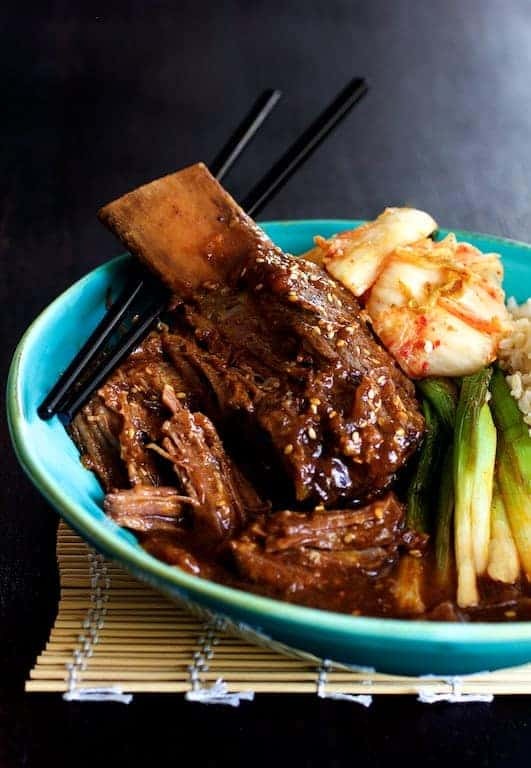 In the ingredients section it says that you used kimchi, where do we get the Kimchi recipe to make this beef short rib recipe? Hi, Abby, Thanks so much for your question. 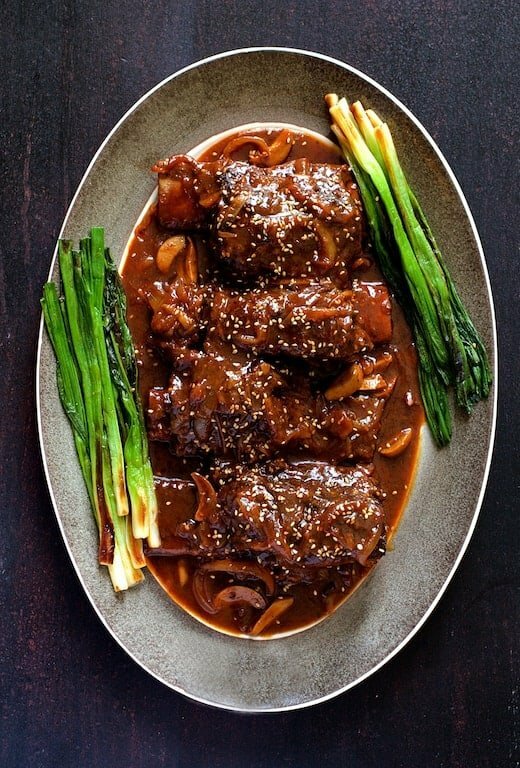 You don’t need a kimchi recipe to make these short ribs; I listed it as something to serve WITH the short ribs. I have a kimchi recipe on my site that I enjoy but making kimchi is a project that takes several days. https://www.fromachefskitchen.com/homemade-kimchi/ Good kimchi is available at international markets, Whole Foods and Kroger stores have a wonderful brand–King’s. Thanks so much and hope you enjoy! Hi, Margaret, Thanks so much and you are very welcome! Glad you and yours are enjoying and please keep in touch. I made these the other day in my Instant Pot using the ‘meat/stew ‘more” setting. They were fall off the bone perfect and I think the two days they sat in the fridge before we ate them only enhanced their flavor. Served with a rice noodle/slaw salad, steamed broccoli, rice and your browned scallions. This is a definite keeper!! Thank you so much for sharing! Thanks so much, JP! Yes, it’s amazing what a day or two in the fridge can do for some foods. Thanks again and glad you enjoyed! Is each rib 2.5 to 3 lbs or is that for the whole dish? Hi, Karen, Thanks for your question. It’s 2.5 to 3 pounds for the whole dish which will equal four long-cut beef short ribs. Each short rib should be about 3 to 4 inches long. Some butchers will give you the full rib which is crazy big. Generally, most butchers cut them in half which is the size you want. Thanks again for your question and hope you enjoy! Just made this. Wonderful. Thank you. I don’t have a slow cooker but do have dutch ovens as I braise meats regularly. I browned the meat well, then removed them and put in onions in for couple mins. Then just added the garlic and the sauce mix replaced the ribs and into the oven at 275. I waited a bit too long otherwise would have used 250. Cooking time 3 1\2 hours. The gochujang and kimchi were wonderful additions. I had some baby bok choy so made that as another side along with brown rice. My wife loved it too! And we have leftovers. Thank you again. Hi, Peter, Thanks so much! I’m also partial to using a Dutch oven and slowly braising in the oven but they can be done either way. Thank you again and so happy you enjoyed! Made these fabulous ribs on Sunday. Everyone asked for the recipe. Did not have Gochujang. Bought it yesterday, tasted it and found it too hot. Hi, Shirley, Thanks so much and so glad you enjoyed. Gochujang can vary by brand and everyone has different spice tolerances. If you enjoyed the ribs without it, then no need to add extra spice! Thanks again and please stay in touch. I this recipe seems easy and delicious. I was wondering what the alterations would be for boneless. I have a slow cooker but could they be made without the slow cooker? What would be your recommendation? Hi, Genesis, If you plan to do them in the oven, I would braise them at least 2 1/2 hours at 325 degrees. Boneless short ribs are cut from the chuck, so essentially you’re doing pieces of chuck roast. Thanks so much, hope that answers your question and hope you enjoy! Hi! I will just looking at the ‘Nutritional Fact’ and the numbers seem terribly high. Are they correct? Hi, Dalisay, Thanks so much for your great question. In reality, a nutritional analysis is seldom very precise unless it comes from a laboratory. The recipe format I’m using was created by a health and nutrition blogger who tried to make it as accurate as possible. Instead of indicating 3-4 servings, I changed it to 4 so gave you a more precise count per short rib. 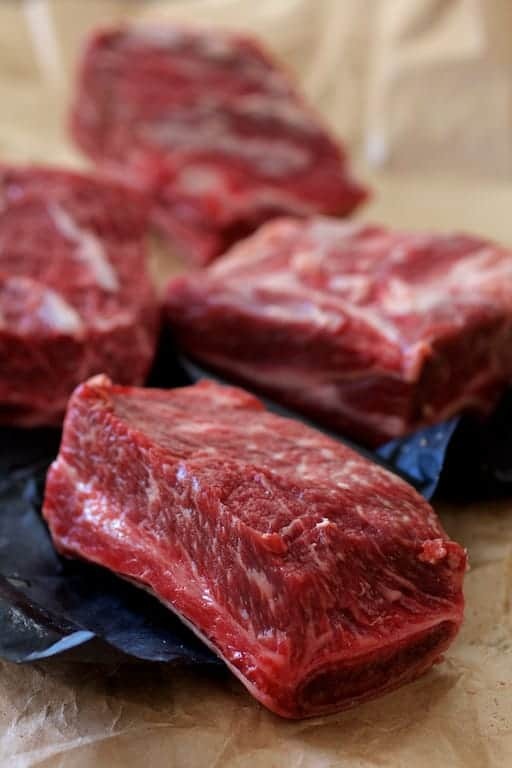 Beef short ribs DO have a lot of fat and connective tissue which is going to melt off into the sauce. If you want to take that out, I would advice cooling the ribs, chilling thoroughly and then you should be able to remove a lot of that fat. Thanks again and hope this helps! Hi, Becky, Thanks so much for your question. The carb count does not include the rice because it’s really not part of the recipe; it’s more of a suggestion. If you’re concerned about carbs, by all means, use cauliflower “rice.” Thanks again and hope you enjoy! Dear Carol – This recipe was amazing. 4 hrs on high in the slow cooker was perfect. I didn’t change a thing, and received a literal high five from my husband. Thank you so much. Hi, Reese, Thanks so much and you made my day! So glad you and the hubby enjoyed! Hi, Heather, Thanks for your great question! They are English-cut, but flanken would work if had to. I like the presentation of English cut much more! Thanks again and hope you enjoy! Thanks, Loren! That’s awesome! I love that idea! Please stay in touch! Hi, Mimi, Thanks so much for your kind words! I’m so happy it worked well for you and your family! Please stay in touch. I’m not sure where you are located but Korean food has been popular where I live for quite some time now. Along with Korean culture, entertainment, and skincare. Hope you continue to discover different Korean dishes! Happy eating! Hi, Sharon, I live in the Memphis area… land of barbecue. I only know of one or two Korean restaurants in this area–would love more! Thanks for your comment. Hi, Jo, Thanks for your question. It’s plain rice vinegar. Seasoned rice vinegar contains salt and sugar. It will be clearly labeled. Thanks again and hope you enjoy! Question: Do I just ask for 4 long-cut bone-in beef short ribs at the butcher? Will he know what that is? Thx. Hi, Catherine, Thanks for your question. He should know. The butchers at the Fresh Market where I shop generally cut them two ways: Really short, like only about 2 1/2 inches or long, about 5 inches. 5 inches is a good length to work with. I had a butcher give me the entire rib once which was about 7-8 inches long and that probably won’t fit into your slow-cooker. About 5 inches is what you want. Thanks again and hope you enjoy! How long would I braise the ribs if I don’t have a slow cooker? Hi, Cris, Thanks for your question. I would do 2 1/2 hours at 325 degrees. Place some aluminum foil over the top of your pot before placing the lid on so that the liquid doesn’t evaporate too much. You can also use parchment paper. Hope you enjoy! I’m so looking forward to “braising season” again! Looks delicious! I’m a big fan of short ribs but haven’t ever tried anything like this! Yum!!! I’m drooling over these Carol – What an amazing looking recipe. Your photographs are AMAZING! Oh my goodness! This looks amazing. I’m a huge fan of short ribs, but haven’t tried them Korean-style. Now I just have to find gochujang. You consistently post recipes that sound and look divine! Can’t wait to try them all!